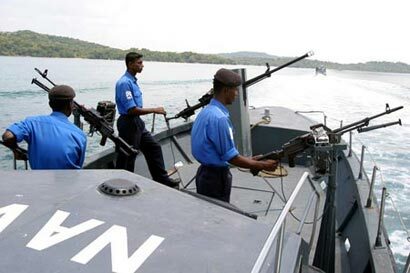 Sri Lanka Navy today arrested 22 Indian fishermen for illegally entering Sri Lankan waters. Navy spokesman Commander Kosala Warnakulasuriya stated that the fishermen along with their 6 trawlers were intercepted by navy patrol boats in the Northern seas off Delft Island. Four of these trawlers are fitted with GPS equipments which confirm that they have purposely entered in to Sri Lankan waters, navy said. The arrested fishermen were brought to KKS harbor and are to be handed over to the fisheries inspector in charge of the region for onward action, the spokesman said.